Your each your destination and open your bags to find that all the tidy packing has shifted and everything can be a mess. Most backpacks and suitcases have some kind of strapping mechanism, like a ribbon, to keep everything organized. However, not all of them do. You can use a regular ribbon or a plastic bag, but you are adding things you won’t use in the travel (maybe some bag for the trash or for the dirty laundry). There is a cheap and more useful solution. We all need belts so why not make the best of them for this purpose? It’s a cheap solution because you already have one. And it compress the bag contents and make space for those extra shoes. 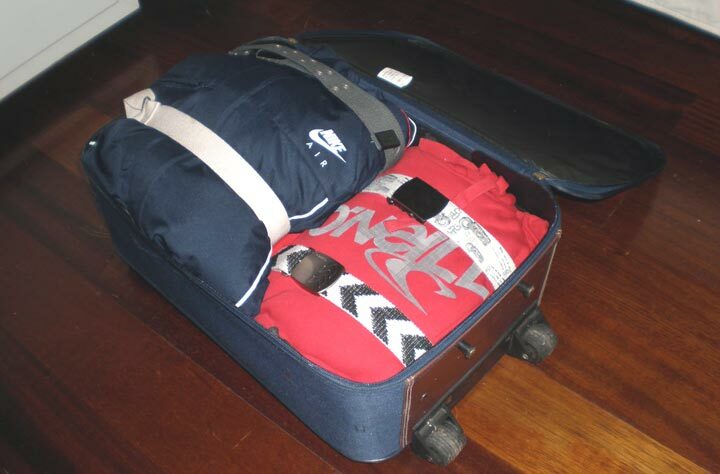 Just stack up the clothes over belts, possibly two, as shown and pack them in the bags. Simple!